Review of Azhia’s The Dancer’s Companion: Preparation, Drills & Cool Down – A t i s h e h. Dance. Fitness. Joy. I’m about to do something awful. I’m about to review a DVD you can’t get. Well, I’m sure you could try. Someone on Bhuz probably has it. But when I got the video Azhia was selling off her last batch. In fact, as far as I can tell, she’s retired as a dancer and focusing on her career as a makeup artist. Which is a shame, because not only is she a beautiful dancer with great technique and a modern feel, but she has some cool ideas about how to put together a bellydance practice DVD. The Dancer’s Companion: Preparation, Drills & Cool Down is a modular program composed of a brief introduction, a 16-minute “Preparation” for dance, 24 minutes of drills, a “Beyond Basics” section that suggests ways to vary the drills, and a brief cool down. Ah yes, and two studio performances. The Preparation is not so much a warmup as a series of yoga-inspired stretches and targeted muscle work. It won’t get your heart up, but it includes some good things, like grand plies to work on thigh strength and exercises to strengthen the foot muscles. This section could be used on its own to prepare for doing another program — in fact, this was the main reason I bought this DVD. The drills begin with arm positions layered on an ongoing shimmy. These are a little like some of the exercises I loved in Aziza’s arms DVD. Then we get hip eights, vertical and horizontal, performed in both directions and varied. Azhia has you do them both with heels on the ground and bent knees, and with heels up and straighter legs. There are undulations, up and down, and the three basic hip circles — large, small, and omi/afro. The neatest part of the drill section is right at the end, when Azhia has you work on a combo of all of the movements practiced, at different speeds, with different foot work, in order to get the transitions smooth. This is most definitely the kind of thing I need. That said, there are really some neat things about this video. It’s designed for you to grow into. For example, at various points she gives you tips on how to change up the movements. You might take a different arm position, or work at a different speed. 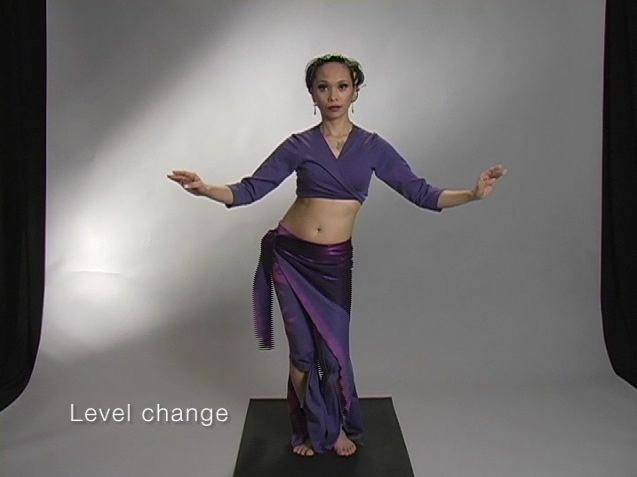 The little “Beyond Basics” section is a mini-tutorial on more things you can do to get even more nuanced movements, like adding a twist to the lower body while doing vertical figure eights, or doing an omi with one heel up, or adding a level change. The result, as it looks on Azhia, is delicious, and it’s worth working towards. Finally, the neatest thing is that the entire instructional part of the video is filmed in three angles: front, side, and back. You can either choose an angle at the beginning of a section, or flip between angles if you have magical DVD remote control powers. I do not, alas, have the latter, but I did find that watching the DVD on my Mac’s DVD Player, I could go to the Features menu and choose “Angle” to pick my angle, and it would switch right in the middle of the video. This seems like it would be particularly good if you’re interested in seeing how those horizontal figure eights look from the side, or if you want to follow Azhia from behind as if she were a live teacher. This is explicitly not a beginner video — you need to know your basics. But Azhia still gives you a lot of tools to check up on how you’re doing even when you don’t have a teacher in the room, as well as ways to grow beyond the basics of what she demonstrates in the video.